An airplane – but why tears? Why moved? Will I ever “finish” reading the Search, stop discovering new things? Clearly the answer is no, for here today is a new discovery (new, I mean, for me.) But it leaves a question. But I think that in addition, the tears are of something else. 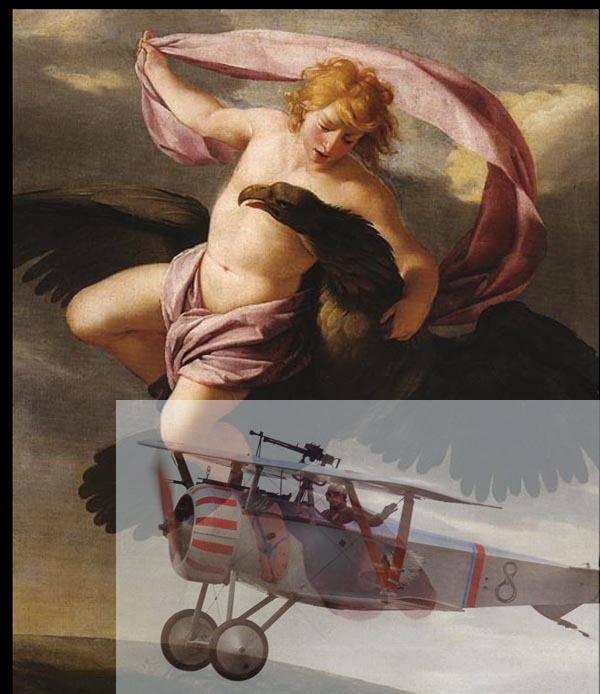 As he imposes the myth of Ganymede onto the man borne away on the airplane wings, M has “aestheticised” the moment. He has created an extended metaphor. For M (as for Proust), is beginning to sense that metaphor and similarity are at the very heart of art. This moment with Ganymede and the plane is a metaphor moment and is as “joyful” as, for example, seeing the 3 trees of Hudesmil in unity with the 3 church spires. It is in this recognition that M’s tears come, they are tears of joy – tears of recognizing another artful metaphor in his surrounding reality.